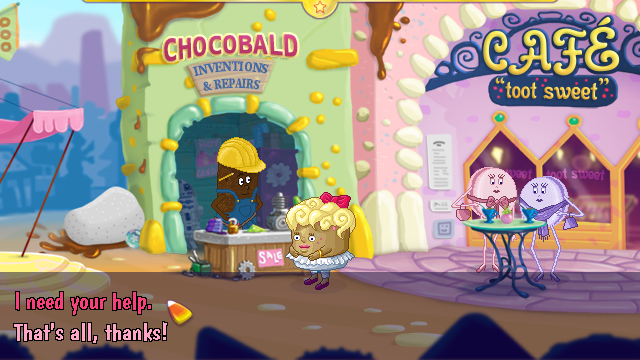 When the mayor leaves town and Toffee is in charge of Creamville, anything that can go wrong, will go wrong. Now with German translation. This is a very sweet game. Funny music, sweet and fluid animations and a little story that makes sense in itself topped with some puzzles and a small (sweet) shooting minigame (no blood!) make it a game for young and old! Cute and original, a tasty little story with some fun puzzles to solve. Beautifully created, the kids loved it! It's a very sweet little game! 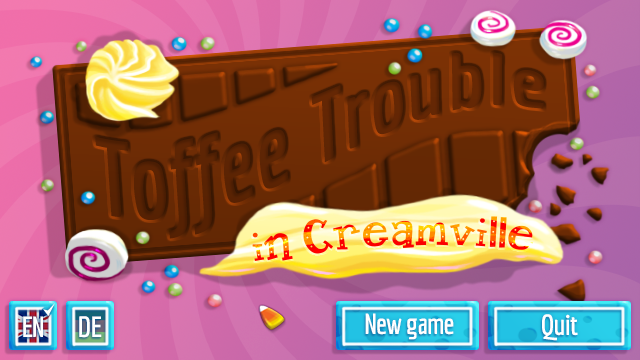 This is a good short little adventure game for all candy's fans and the quests in this game are not too hard. Is this an epic rescue quest for the youngest adventurers in the afternoon? Sure, and by far one of the sweetest. Playthrough took me around 37min. Is it good? Yes. But it's not your common 'muffin meets bagle' rom-com. Being a dunkin' funride throughout, this is a coming-of-age story of a young female dessert. What makes this one-month-accomplishment stand out is its unmatched quality and pure love for freeware adventure-making. The creative work by Dutch illustrator Miez with additional art by cat is a real treat: Warm and lush colors, yet never oversaturated. Impressive special fx! Original and tasty characters, especially the yummy female lead. With blending digital handdrawings and pixel mousework so well together... what talent! Besides, it's just these illustrations which makes this hilarious story-setting written by cat believable. I loved the humorous puns and catchy dialogue, relaxing to read with the colored font. She also pulled off all the technical part, the gameplay is convenient and polished up to a gold-finish. Puzzles are easy to tackle for beginners (like still me), but have an absurd and anarchic twist as in 'Sam and Max'. In other words, some deal with exploring, socializing, not giving up, and some require a little mindwork, e.g. 'open locked door with candystick'. Still being all logical in respect to the physics laws of a sweet shop. Storywise, the linear narrative unfolds not stepwise like a family saga. As opener you are confronted with a tough challenge, solvable in a couple of tasks. Just like in the classic Hercules myth. Happy-go-lucky Toffee has to team up with other delicious inhabitants and take responsibility for her sugartown. This allows her character to progress a little. First naive, then compassionate, then proud, then.... 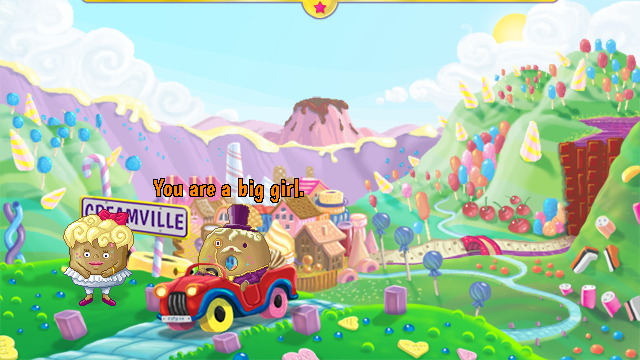 In the end, she lives up to the expectations of both her in-game father, respected mayor donut, and myself. And you benefit by knowing how far you are into the game without having an oldschool achievement point system. (1.) Since when do we commercial-like value in MAGS? (2.) Will I be able to revisit Toffee Trouble in, let's say 12 years, with hopefully my own kids? I give it 16 out of max. 18 points (aka 1-). mostly because I was also looking forward to Gigadeath 10+ in their announced "Eruption"-disaster game. But that turned out to be just a friendly hoax, right? This is a fun little game that I really enjoyed playing. Lovely game with stunning graphics. A thoroughly enjoyable game, short as you'd expect from a MAGS game but beautifully made.